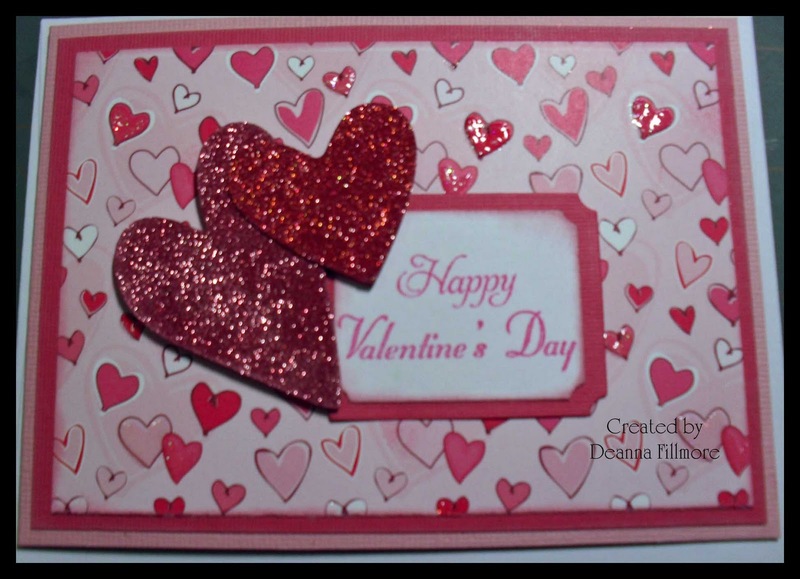 L'il Dee's Crafting with a Kitten: Happy Valentine's Day!!!! I do hope everyone has a day filled with chocolate & happiness. I have made several valentine cards this year but have not had time to post them. I'm sorry I don't have time to post the details for these today but I will post them tomorrow. I'm off to buy my hubby something special for Valentine's Day. He is such a great hubby, and I'm the luckiest girl to have him as my valentine. As promised here are the updates. The patterned paper for this card is by Cloud Nine Design from the Sweetheart collection. I cut the hearts out on my cricut using gypsy wanderings. I put double sided tape on the paper before I cut them out. I then covered them with rose copper glitter by glitter ritz and colored one with a rosebud memento marker to make it a slightly deeper color. 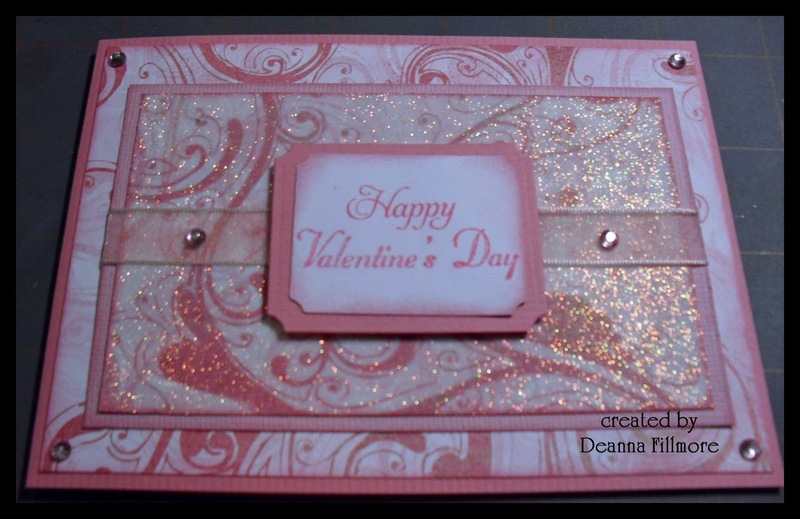 I used spellbinders small & large labels to make the pieces for the greeting. 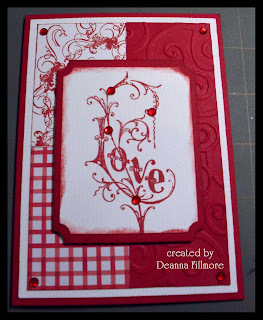 The Happy comes from the flourishes tag lines stamp set and the Valentine's day comes from the All Night Media Celebrations stamp set. The greeting was stamped with worn lipstick distress ink and the edging was done with pink petunia versa magic. The colors on this Love card did not show up properly. The card base is almost the same red as the "Love" and the hearts on the paper are a deeper red as well. I used gypsy wanderings to cut this out with double sided tape on the paper, then covered it with fire red glitter. The patterned paper is from the fancy pants love birds collection. I colored the bling with a crimson prisma marker. The base for this card is a dark red. Peter really liked his card :) The image stamp is by bombshell stamps. I colored her with copics and cut her out and attach her to the card with 3d dots. I did a little bit of paper piecing on her bikini top. More glitter pieces from the cricut, I used rose copper glitter and colored it with a brown memento marker to deepen the color a bit. The patterned paper is from the basic grey porcelain line. The "all i really want is" is also from bombshell stamps. Copic colors E000, E00, E01, R20, RV10, RV13, Y11, Y13, Y14 & BG10. The patterned paper for this card is from the basic grey "two scoops line", card stock is dark rose & cherry vanilla. The middle piece is covered with double sided tape and micro fine warm highlight glitter by glitter ritz. The red & white check paper is from best creations sweet love, the other red & white piece is a stamped piece I made using basic grey flourish stamps & fired brick distress ink. The embossed piece was done using d'vine swirls embossing folder. 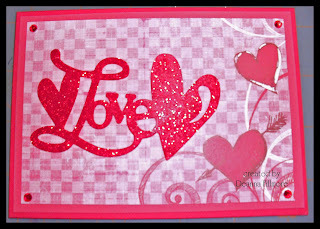 The love stamp is from crafty secrets "cherish" set. Well I think that covers most of the details for these card. Thanks for stopping by. These are all beautiful cards. Anyone would be lucky to receive one of these.